S-Wrap Finish Coater With Fast Change Topside Heads | Black Bros. The Finish “S Wrap” Coater is a “Fast Change” multiple topside head coater designed to apply a precisely metered amount of coating to both sides of the strip simultaneously. The Fast Change option allows operator to change colors and paint within seconds to the top side of coil. The backup drums for the two topside coating heads are configured for “Off-Drum” or “On-Drum” coating (the actual change from “Off-Drum” coating to “On-Drum” coating is accomplished by inserting or removing spacers on the applicator roll frames). The strip enters the coater horizontally at floor level, passes through the coater in an “S” configuration and exits in a horizontal plane. 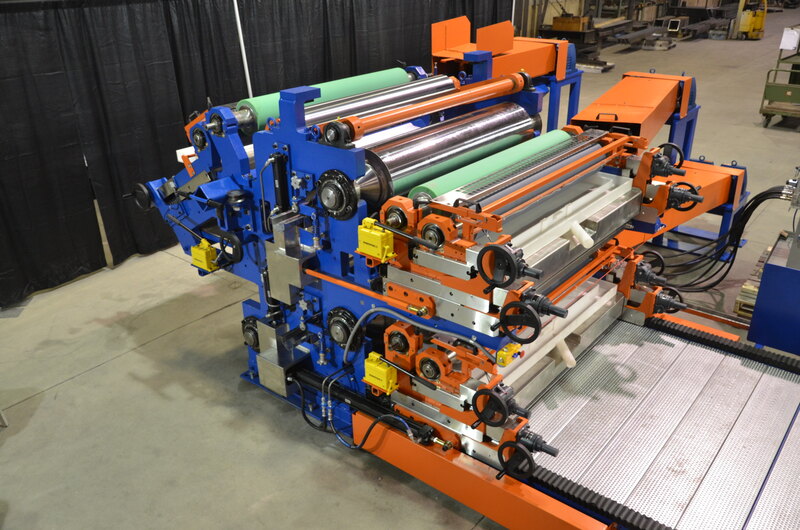 The coater is equipped with two (2) “Fast Change” two roll top side heads and a two roll bottom side head and includes topside head applicator roll disengage mechanisms on both heads for splice pass clearance, and complete coater head retract for roll removal and maintenance. The bottomside head is fixed and is equipped with an applicator roll removal feature that allows the bottom head applicator roll to be rolled out from under the strip to the operator side of the coater. The applicator roll removal feature allows for easy and convenient roll cleanup and roll change.